The rise in popularity of e-bikes and e-scooters demands an increasing need for longer-lasting e-bike/e-scooter battery packs. A longer run time allows for further travel and less frequent charging. To achieve longer-lasting lithium-ion (Li-ion) batteries, you can choose one of two methods: either increase the total battery capacity or improve the energy utilization efficiency. Increasing the total battery capacity means adding more or better battery cells, which can significantly increase the overall cost of the pack. Meanwhile, improving energy utilization efficiency gives designers more usable energy without increasing capacity. There are two ways to improve energy utilization efficiency: increase the state-of-charge accuracy and/or reduce the current consumption. Cell voltage measurement is the easiest, but it also has low accuracy overload conditions. Coulomb counting measures and integrates current over time. But achieving better state-of-charge accuracy requires regular full-to-empty learning cycles, and state-of-charge accuracy will be affected by self-discharge and standby current. Low temperatures and an aged battery will also lower state-of-charge accuracy. Impedance Track technology directly measures the effect of discharge rate, temperature, age and other factors by learning cell impedance. Therefore, the Impedance Track method gives you better state-of-charge gauging accuracy even with an aged battery and low temperature. Our Accurate gauging and 50-μA standby current, 13S, 48-V Li-ion battery pack reference design uses the BQ34Z100-G1, an Impedance Track fuel gauge for Li-ion, lead-acid, nickel metal hydride and nickel cadmium batteries, and works independently of battery series-cell configurations. The design supports an external voltage translation circuit that is controlled automatically to reduce system power consumption and gives users longer run time on each charge without the concern of potential damage from overdischarge. The whole system has quite limited effects on the gauging result because of the low current consumption. As a result, I used BQStudio to read data directly from BQ34Z100-G1 under constant discharging current at room temperature. Figure 1 shows the discharge state-of-charge test result. The second method to improve energy utilization efficiency is to decrease the current consumption. The accurate gauging reference design introduces an optimized bias supply solution, shown in Figure 2. The design utilizes our new LM5164 as the auxiliary power supply. 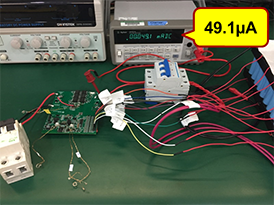 The 100-V LM5164, a wide input, low quiescent current buck DC-DC converter, protects the system against potential transients from the nominal 48-V battery and powers the 3.3-V microcontroller (MCU) and BQ34Z100-G1. The input of the LM5164 is controlled by two signals: REGOUT from the BQ76940 and SYS from the MSP430™ MCU. Either of these two signals is high will turn Q1 on and enable the input of the LM5164 – and therefore enable the MCU power supply. When the board is just out from the factory and the battery management board powers on for the first time, it is in ship mode. The whole system, except for the BQ76940, is not powered on, achieving as low as 5-µA ship mode current consumption. Pressing button S1 will set REGOUT high and power the system on. When the MCU powers on, it will set SYS high. The whole system has a stable power supply regardless of whether the BQ76940 is in shutdown or normal mode. To achieve all e-bike battery pack functions when in standby mode, including charger attachment/removal and load attachment/removal, you need to power on the MCU. Q1 should be on. 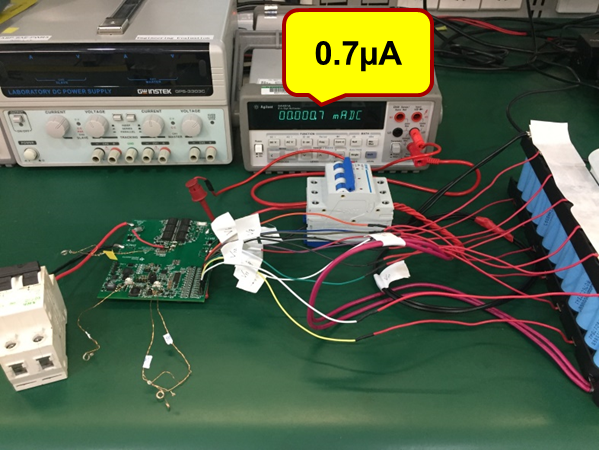 To decrease the standby mode current consumption, the BQ76940 is set at shutdown mode through the I2C command. Therefore SYS is high, to maintain Q1 as on. The LM5164 is set at a low switching frequency to decrease switching loss, and the MSP430 MCU is in low-power mode. All charger attachment/removal and load attachment/removal detections are achieved through firmware. The standby current consumption is typically 50 µA, as shown in Figure 3. Figure 4 shows the ship mode current consumption of the main board. Overall, the reference design achieves accurate state-of-charge gauging (through the BQ34Z100-G1) and decreases standby and ship mode current consumption (through an optimized bias supply solution). Both of these solutions work together to improve the energy utilization efficiency of e-bike battery packs, giving users longer use time.